Moskowitz uses money from his "non-profit" bingo club to fund violence-prone Israeli settlers and right-wing U.S. political groups. Rather than taking the millions of dollars his bingo and card clubs generate each year and pumping them back into the poor community of Hawaiian Gardens, as he promised to do, Moskowitz sends them halfway around the world. Over the years Irving Moskowitz has spent millions of dollars – from the Hawaiian Gardens bingo parlor he operates and from his private wealth -- to establish a Jewish settler presence in East Jerusalem’s predominantly Palestinian neighborhoods. 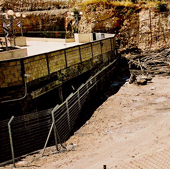 Moskowitz supports these strategically placed projects to prevent specific land-for-peace agreements that would give Palestinians the dignity of a presence in Jerusalem. The projects have provoked violence. Over 70 people died in riots following the 1996 opening of a controversial Moskowitz-funded tunnel to the Temple Mount. Moskowitz also channels millions to violence-prone, anti-peace settler organizations. "Moskowitz's rise to prominence stems not so much from the size of the funds he puts at the disposal of land-purchasing groups…but from his unerring choice of super-sensitive sites…" wrote a Jewish Telegraphic Agency analyst in September of 1997. The US government, which views settlements as "obstacles to peace,” has several times appealed to Israeli leaders to stop Moskowitz's intrusions into Palestinian areas. "Netanyahu opened the tunnel for the right wing,'' says Eitan Haber, the former top aide to slain Prime Minister Yitzhak Rabin. The tunnel not only opens a new Jewish-controlled link in the Old City, but creates a sheltered passageway to the Western Wall from a well-known Jewish yeshiva, or religious school, in the Muslim quarter of the Old City. "We, who had chosen peace, were shocked that our former enemies had chosen to negate our very modest achievement, the Oslo accords, by choosing a government which was against these accords," says one Palestinian. "Since then, everything has been downhill." By last weekend, at least 56 Palestinians and 14 Israelis were dead and more than 1,000 people were wounded. The news reports and other materials in this section detail how in the late 1980s Moskowitz began to support Jewish settlers by funding the secret purchase of Palestinian homes in traditionally Palestinian neighborhoods. Once they had moved in, these settlers intimidated local Palestinians and vandalized their property. This section of the website also includes reports on how, in recent years, Moskowitz has built two apartment developments in locations that are key to Palestinian aspirations in Jerusalem. Now he is populating the developments, Ras al-Amud and Abu Dis, with settlers, using his clout with the current right-wing government, to establish peace-killing "facts on the ground." The roads of Jerusalem are interrupted by police checkpoints. The streets are filled with people fearing the next suicide attacks. And the struggle between Jews and Palestinians for land is not getting any more peaceful, thanks to Moskowitz's Ras Al-Amud settler development. Eldar reports that a newly disclosed government proposal includes a subsidy for settlers who buy apartments in Moskowitz's anti-peace colony. "Their Palestinian neighbors are preparing for the worst. 'We really feel in danger here,' said Azzam Abu Saud, director of Jerusalem's Arab Chamber of Commerce, who lives next to the site. 'Our friends are too frightened to come to visit us.' But he stresses that he and his family will never leave." 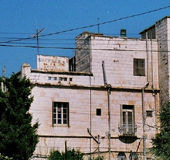 Ateret Cohanim, the militant settler group Moskowitz supports, plans to move families into a house near the Mount of Olives cemetery in Palestinian East Jerusalem. During a 1999 visit to Israel, Moskowitz discussed his Ras Al-Amud development with then Prime Minister Netanyahu and said that, after Israel halted the project in 1997 under pressure from the US State Department, he believed that Netanyahu would let it go forward. 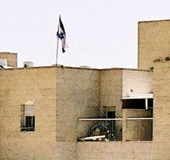 Noted the Jewish Telegraphic Agency (JTA): “Attempts by Moskowitz and his supporters to build Jewish homes in Jerusalem’s mostly Arab neighborhood of Ras al-Amud have been a repeated source of strain between Israel and the Palestinian Authority.” JTA also reported: "Moskowitz's status as a champion of Jewish settlements was affirmed when he visited Hebron on Wednesday. Children danced while settlers sang nationalist songs to welcome Moskowitz to the often volatile West Bank town." Between 1991 and 2001, Moskowitz gave $754,300 to the Hebron Fund. Only 520 heavily-guarded settlers live in an enclave in Hebron's Old City. Another 6,500 settlers live on Hebron's eastern border, in the settlement of Kiryat Arba. The Palestinian population of Hebron, or Al Khalil, is around 170,000. Israeli authorities often impose a curfew on the Palestinians for the settlers' security. “This is a rundown town in the rundown eastern corner of Los Angeles County. Besides the palm trees, little here suggests Hawaii,” begins the report, which focuses on the massive, purportedly charitable Hawaiian Gardens bingo operated by "the reclusive and wealthy doctor, Irving I. Moskowitz," and the poor, predominantly Latino city, where Moskowitz also has a for-profit casino. 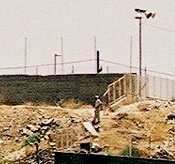 In 1997, when Moskowitz moved militant settlers into his strategically placed property in Ras Al-Amud, the Clinton State Department termed Moskowitz’s actions “a lightening rod for an increase in tensions” that might harm the peace process and the state of Israel. The US and Israeli governments negotiated a stand-down to the diplomatic problem Moskowitz created. In 2003, just as the US launched its war against Iraq Moskowitz repeated his 1997 Ras Al - Amud provocation disregarding the U.S. State Department , Now, as the Financial Times reported, Moskowitz was challenging the Bush Administration as he moved settlers into Abu Dis. Pro-settler website confirms Ras-Al Amud designed to block peace and reveals that settlers never really moved out. About a month ago, after four years of building, the Jerusalem neighborhood of Maaleh Zeitim was reborn. 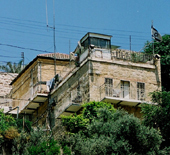 Located just east of the Old City in Ras al-Amud, Maaleh Zeitim has been populated once again by Jews - this time in permanent homes. Dead-of-night entry, outrage, demonstrations. Police presence, politicians holding forth, international outcries. High Court rulings, evictions, re-entries. The controversy over Ras al-Amud is playing itself out according to a well-worn scenario. When a leader of one of the most militant settler groups, Ateret Cohanim, emailed our co-director, we decided to respond. 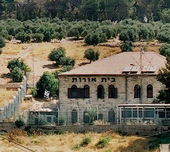 Ateret Cohanim runs a yeshiva where it prepares priests for the rebuilding of the ancient Jewish temple on Jerusalem's Temple Mount - a site currently occupied by two revered mosques. The group is perhaps best known for its involvement with apocalyptic Christian ranchers trying to breed a pure red sacrificial heifer. Irving Moskowitz has given Ateret Cohanim $5.62 million from his Hawaiian Gardens bingo and group members have participated in his purchases and occupations of Palestinian properties in sensitive areas of Jerusalem. We hoped to have a discussion about the purpose of Moskowitz's land buys. Instead, we got wafts of the rhetoric of pathogenic religion. We have published the emails because we believe they provide an important window into the thinking of the minority of settlers implacably opposed to an equitable land-for-peace agreement. To explain Ateret Cohanim's coded rhetoric, we have published commentary by three scholars, as well as a brief introductory overview by Coalition Co-Director and Rabbi Haim Dov Beliak. The Coalition for Justice in Hawaiian Gardens and Jerusalem has found columns in Jewish newspapers by Irving Moskowitz and Cherna Moskowitz extolling and justifying assassinations and violent political means to thwart Israeli-Palestinian peace. We do not dispute the Moskowitzes' right, under the First Amendment of the U.S. Constitution, to proclaim their extremist pro-violence views -- and even to fund settlers who violently attack Palestinians. But the Moskowitzes have millions of dollars to spend on their political expression, thus their advocacy predictably results in death and injury. Irving Moskowitz, who shakes Jerusalem politics to its roots, also dominates a tiny Latino enclave in California. It's the beginning of his money pipeline to the Holy City. HAWAIIAN GARDENS, CALIFORNIA Francelia Morales, a 36-year-old Mexican immigrant living in a roach-infested apartment with mildewed walls, has been thinking a lot about the crisis in the Middle East lately. "I feel a link to the Palestinians I never knew before." she said as she sat with her husband and three children amid the cardboard storage boxes. childrens toys and English-language instruction video cassettes that crowd her small living room. Her neighbor from just a few doors down feels similarly. "I feel like I understand what the Palestinians are going through." nodded Arturo Perez. Its the same thing like what we are going through here." Like 16 other families in this row of clapboard apartment units set on a narrow asphalt alleyway outside Los Angeles the Morales and Perez families have received 30-day eviction notices from their landlord, Dr. Irving I. Moskowitz, the controversial right-wing Jerusalem developer who emerged last week at the center of the Israeli-Palestinian crisis. But unlike most of them, the Morales and Perez families, and three others, are defying him. The door of Irving Moskowitz's home near the Montefiore windmill in Yemin Moshe, Jerusalem's first Jewish neighborhood built outside the ancient walls a century ago, was barred and bolted. The shutters were sealed. A gossipy neighbor said the owners were seldom there, two or three days at a time, then off again. It was noon on Friday, Sept. 19, barely 14 hours after three Jewish tenant families had evacuated houses bought by the Miami-based bingo magnate in the Arab neighborhood of Ras al-Amud on the other, eastern side of the Old City. Earlier in the week, Moskowitz had stood in that gritty, neglected urban village on the flank of the Mount of Olives, hammering a mezuzah on a door post and telling the world's TV cameras that this was where "we" are making "our" home. Yet the truth was that as soon as he had signed a face-saving deal with the government of Israel, he was on the plane back to Florida in time for Shabbat. Dr. Irving Moskowitz Has Sent Millions From Hawaiian Gardens Club To Groups Trying To Thwart Mideast Peace By Buying Land In Contested Areas. His Activities Raise Controversy At Home And Abroad. An Israeli doctor working in a Manhattan hospital asked his colleague last week, "Who's the prime minister of Israel?"